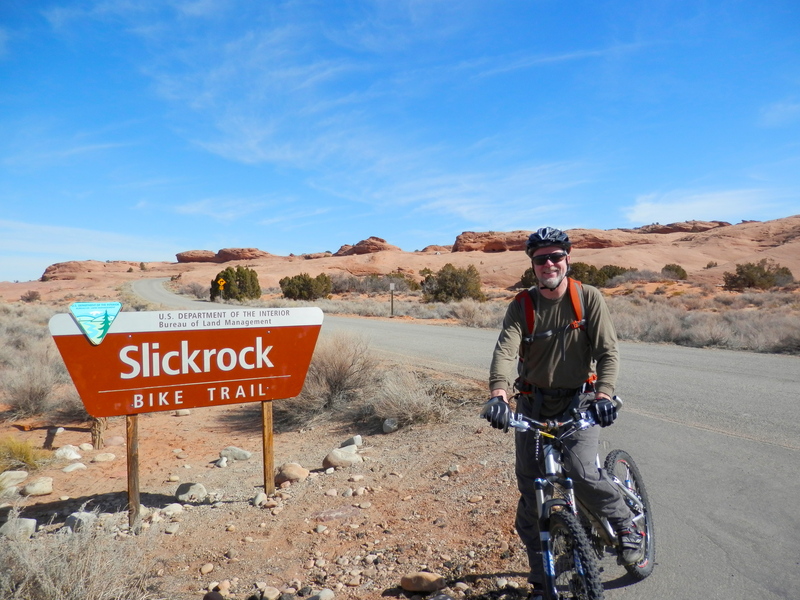 So, we arrived at the world-famous Slickrock Trails in Moab, Utah. We set up camp across the road from the entrance. Gorgeous campsite! Right across the road from the trailhead. Even though it was about 40 minutes until dark, we tried out the trails, intending to ride more extensively in the coming days. Or, rather, I tried out the trails. David had already been to Moab several times before. He loved this technical riding and looked forward to introducing it to me. He calls it riding on Velcro! 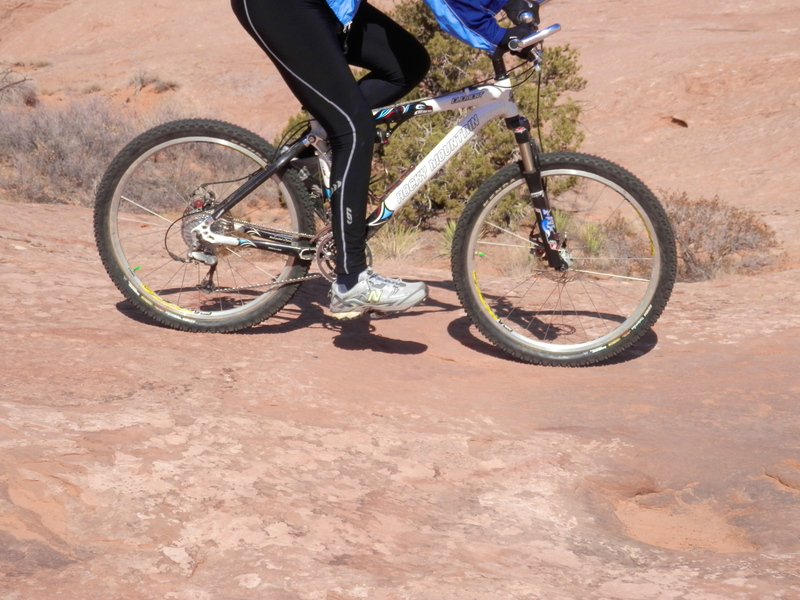 The 11 miles of Slickrock Trail routes climb up and down the petrified sand dunes, actually Navajo Sandstone. It’s not recommended for unskilled mountain bikers. 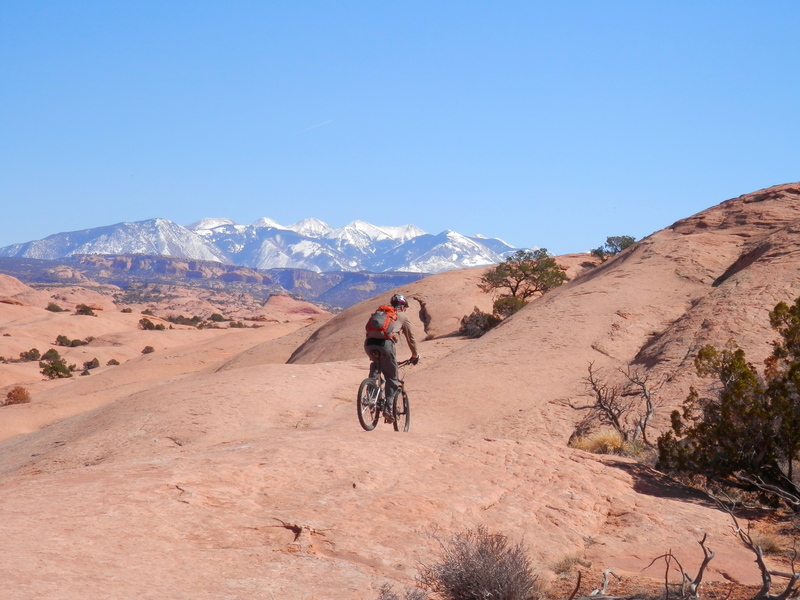 The scenery is gorgeous, with the snow-covered La Sal Mountains as a backdrop. And I hated it. Really didn’t like it at all! To be fair, we had just driven all day to get here and were tired. We hadn’t changed into bike clothes, just put on our bike shoes and set out on the Practice loop. It was scary. I could not get up most of the hills. Going down was so nerve-racking, I hopped off the bike only to find that the metal cleats on the bottom of the shoes slipped on the rock surface. Gargh! 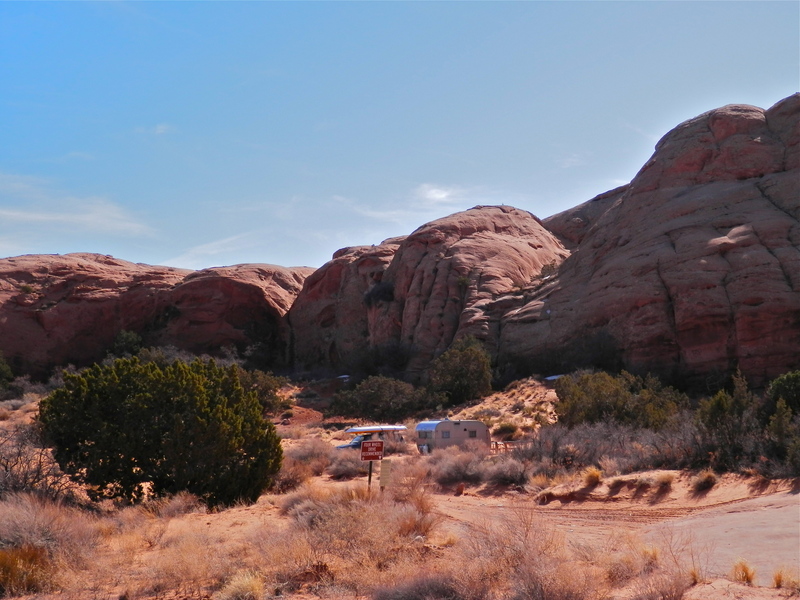 The formations are called “Slickrock” because horses, with their own metal shoes, did not have reliable footing. Not so for the rubber tires on bicycles and motorcycles. The rock surface is similar to sandpaper. Tires grip really well. David is a very patient man. He was disappointed that I didn’t like one of his favorite mountain biking experiences. But, he asked me to try it again the next day, this time with my running shoes, for grip when I step off the bike. Instead of heading for the marked trails, we practiced on a big rock in the campground. And, slowly, I got the hang of it. We advanced to the Slickrock Trail. Now that I trusted the surface, it became easier. And much, much more fun! Lots of ups and downs and turns. 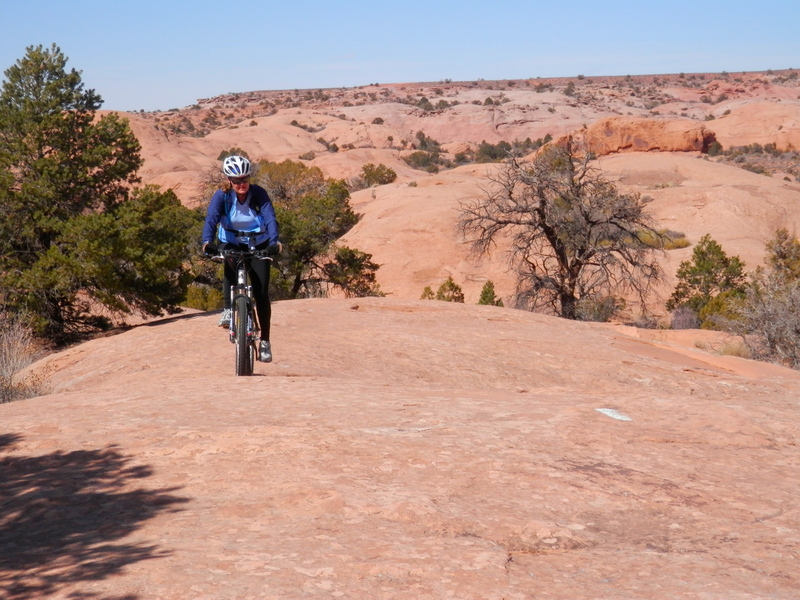 There were white dots on the rocks to mark the trail, but you can ride your own course to navigate the hills and valleys, staying near the dots, if not exactly on them. 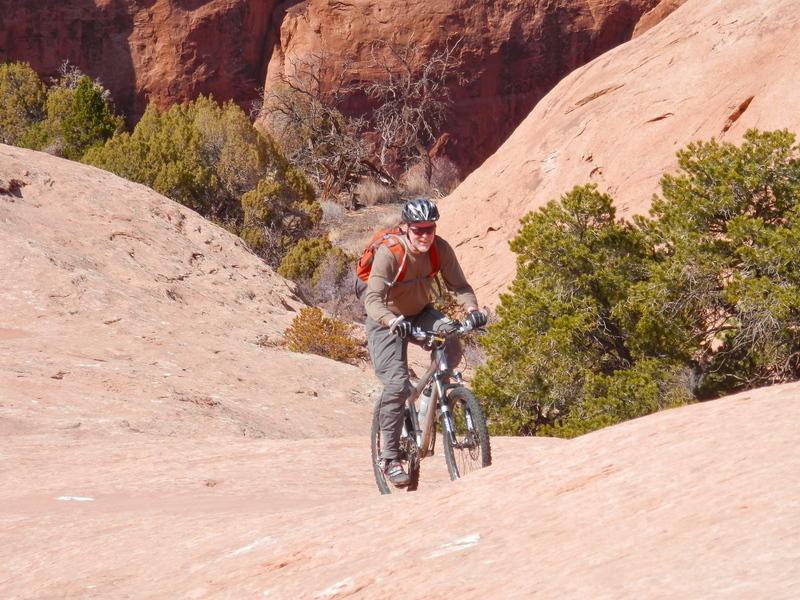 Yes, the Moab Slickrock Trail was fun! We rode the loop one way, then turned around and rode it the other way. The next day, David went back out for more. Moab novice Jane eyes her mark. On The Voyage of the Tramper, we have found many wonders we’d like to visit again someday. Moab is definitely one of them now, for me and for David! 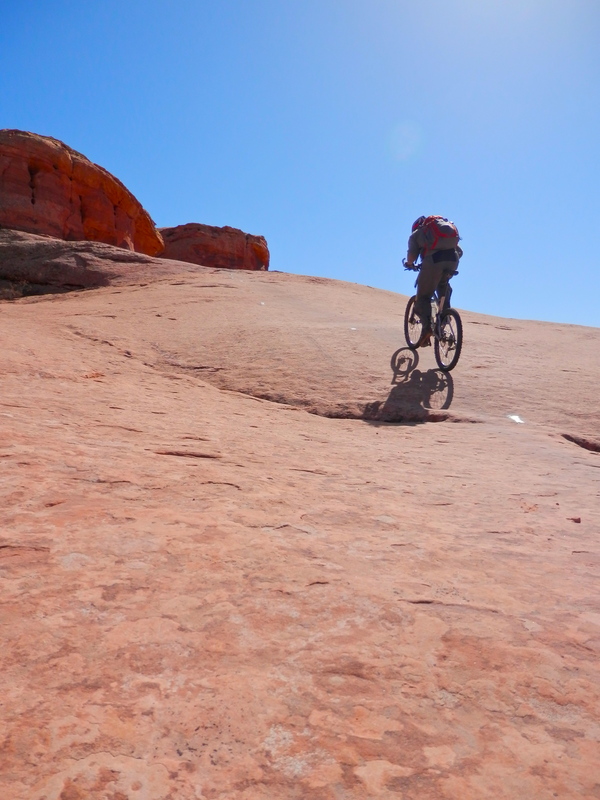 Future “Moab Mountain Bike Weekend”, anyone? This entry was posted in DAY posts, Health & Fitness, Mountain biking, Photos, RV Living, Strange Camping Spots, Strange Sights, Tramper pictures, Travel in the USA and tagged Health & Fitness, Jane, Mountain biking, nature, outdoors, scenic beauty, Tramper pics, travel. Bookmark the permalink. Man could I have some fun there!! We only now begin to tool around the rocks near home. Winter is abating. I love the desrt out that way. Miss it. You guys are having a blast! Will you get to Bryce canyon? What about snowbird and alta etc? Vince – No Snowbird or those other resorts in the canyons outside SLC. They were a bit out of the way AND we didn’t have any discounts for those places. But they are wonderful! I can relate to the “sandpaper grip rocks” (sort of). Use to ride my motorcycle up a steep cement grade (45 degrees plus) under an I-83 overpass ramp off the NCR. Turning around to go down was really scary at first but the grip inspired confidence. Hope you are having fun – see you soon! Vince – The desert is beautiful and we are loving it! We got to Zion but not Bryce. Next time! Joe – Good to hear from you! Good grip does inspire confidence. David is looking forward to riding motorbikes with you this summer! Very interesting to hear the reason for the name “slick-rock”. Never really thought about it. Another great feature must be that you don’t have to worry about dodging horse poop on the trail! Miss you guys and will miss you at Dirtfest this year. Brian, Yup twas the first I’d heard it. Poor horsey. Apparently unshod mules do quite well; In 1990-something, a mule driver challenged a biker to some “rides”. No winner was declared, but both went far onto the rocks in duel… when is Dirtfest? We are actually headed East as we write.